It’s one thing to write down what you own, but it’s an entirely different story being able to prove its existence. Not only that, but a picture can also easily capture any imperfections in an item’s condition (e.g. cracks, scratches, dents, etc.). As they say, a picture is worth a thousand words, so make sure you visually document all of your important belongings. Once you have pictures of all your items, make sure you write down every detail you can about them. This includes the item’s name, manufacturer, model/serial number, date purchased, purchase price, and any anything else that would help the insurance company identity the value of the item – even old receipts. The more they know, the more accurate they’ll be with their compensation. One of the hardest parts about making an apartment inventory is simply organizing all of the information. Thankfully, the National Association of Insurance Commissioners (NAIC) created an app that does just that. 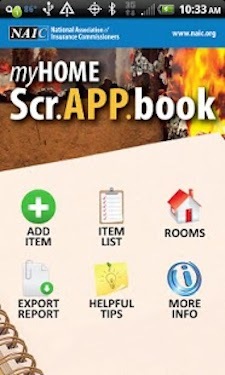 Using the free MyHOME Scr.APP.book app, policy owners can easily take pictures, add descriptions, and store them electronically for safekeeping. From there, the app organizes the information by room and even creates a back-up file for email sharing. iPhone users can download the app here, and Android users can download the app here. As you know by now, having an inventory is crucial to receiving the full compensation from your insurance company. That being said, if your only copy gets destroyed along with your all of your possessions, you’ll really be stuck up a creek without a paddle. To make sure that won’t be the case, make several back-ups of your inventory and keep them in a safe location somewhere other than your apartment. Whether it’s a digital copy on a flash drive or simply more hard copies, you can never be too safe. After going through all the work of putting together an inventory, it’s easy for policyholders to call it quits when it’s finally finished. However, you should regularly update it if you want to be compensated for any new items you might have purchased since creating your last documentation. Pick a date every 6-12 months to go through your inventory and make any revisions/additions. Likewise, if you make any expensive new purchases, document them right away, just in case. Plain and simple, renters insurance can be a lifesaver. And while every policy will vary slightly from insurance company to insurance company, every policy will need an inventory. 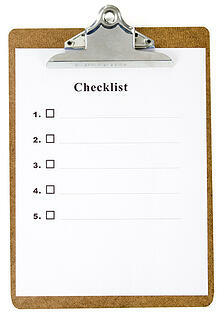 For additional help with creating your apartment inventory, please contact your local insurance agent.